Tree is a Straight Front Bowman 11 ½ inch fork, No. 8 dally horn 3 ½ inch high with 3 ½ inch cap, Shovel cantle 4 inches high. 7/8th inch double flatplate rigging. ¾ Inlaid quilted seat Cognac color with red stitching 1 inch wide Cheyenne roll. California half double stirrup leathers with quick change buckles. Stirrups are 3 1/2 inch bell monels with Quarter covers. No. 3 Mixed Flower carving, Dyed background and acrylic red bead border. Braided rawhide hobble ring and hoof pick holder on left billet. 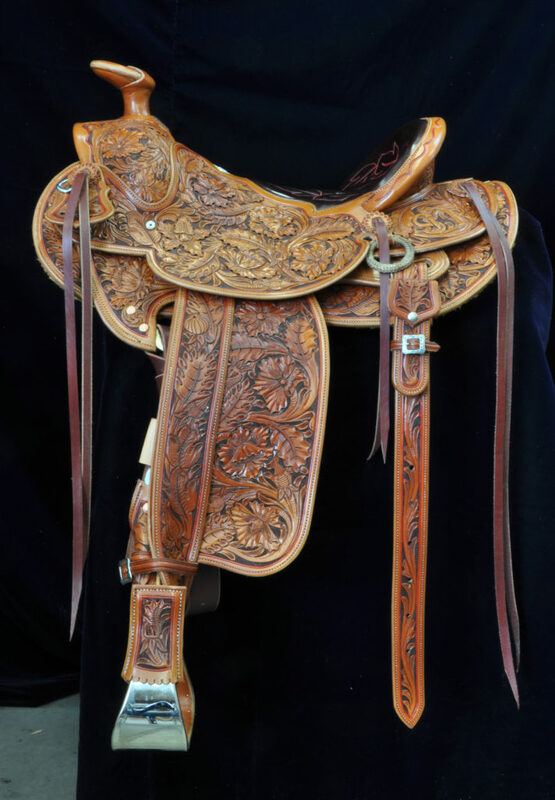 This is a saddle with a lot of class, will go from the branding pen to town in style, a true California Classic ranch saddle. Built for years of comfort and service. 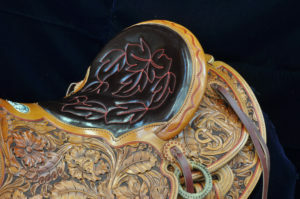 This saddle can be made with any changes to suit you.